Jack McFarlane's wrist shot hits the back of the net to give the Lumberjacks the 1-0 lead. 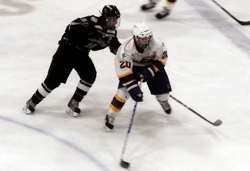 Karson “the kid” Kuhlman came through in a big way Tuesday night at the Cloquet Recreation Center as Cloquet/Esko/Carlton faced-off against Andover in a Section 7AA quarter-final matchup. Kuhlman took home two points, including the game winning goal, in the 2-1 win against the Huskies. Even Jack McFarlane referred to Kuhlman as “the kid” when he passed him the puck through a scrum in front of the Andover net. “The kid” promptly rifled it into the back of the net just 12 seconds into the third period for the 2-1 lead. The goal would be the eventual game winner. McFarlane also took two points in the contest as he scored the game’s first goal with just under 12 minutes left to play in the second period. It was a power-play goal that was assisted by none other than “the kid”. McFarlane scored by taking the puck into the Andover zone and sniped a wrist-shot from the top of the circle over Nate Stong’s glove. Stong had 37 saves in the contest, which could have gotten out of control without the play of Stong. He made several key saves throughout the game to keep it close for the Huskies, who’s only goal came also on the power-play in the second period. 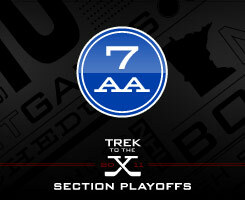 The goal came just 13 seconds into an Adam Hanson tripping penalty at the 7:26 mark of the second period. The game was very subdued as there wasn’t much flow for either team. There was only five total penalties called throughout the entire game and there wasn’t too many big hits. 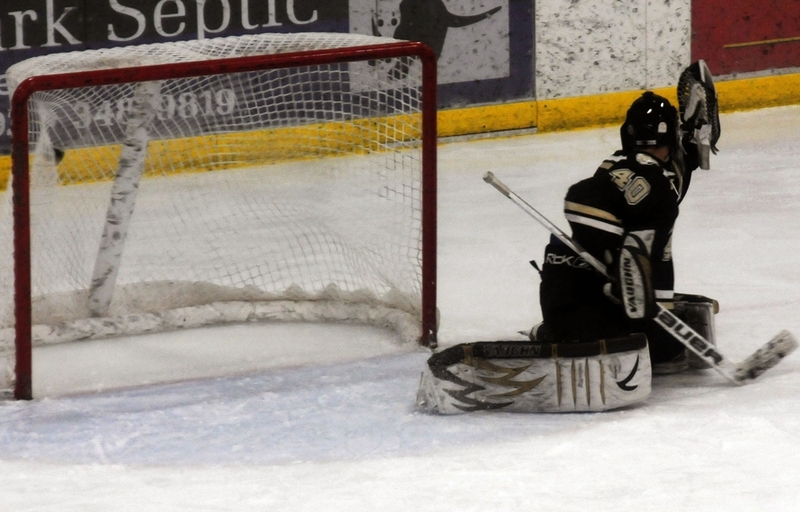 Cloquet and Andover exchanged opportunities throughout but there wasn’t much conversion on many great shots and chances in front of the net. Kaleb Kadelbach went down hard late in the third period with what looked to be an ankle injury. Nobody really saw what happened as the attention was brought to the net which became unlogged simultaneously with Kadelbach’s injury; but it looked as though he went into the boards kind of funny. Coach Esse says Kadelbach’s season is most likely over. After scoring the go-ahead goal in the third, Cloquet seemed to play much of the period on their heels, icing the puck a lot and not playing with that much confidence. Despite the season ending loss, Coach Manney is confident that his team can bounce back with the amount of players he will have return to the team next season. 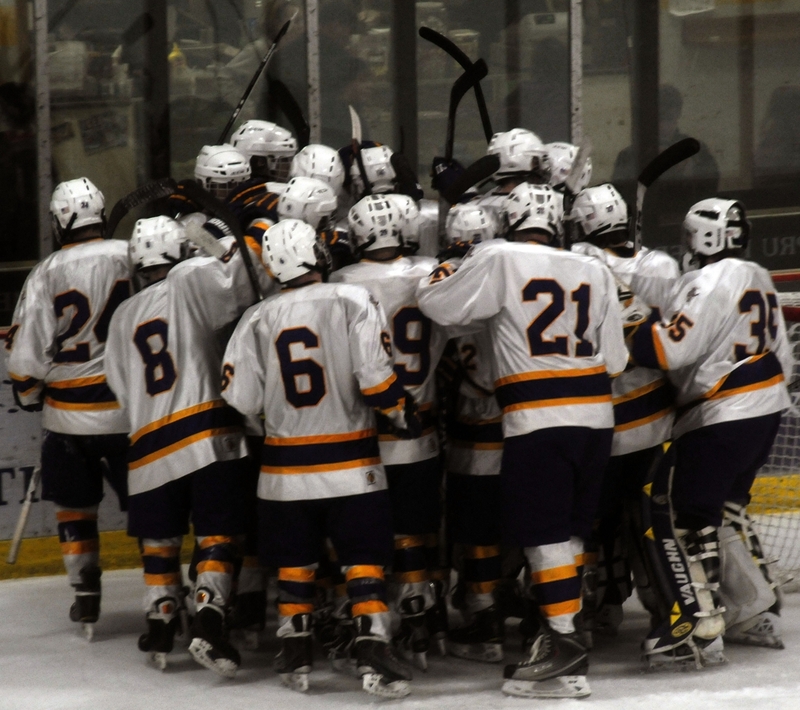 Cloquet moves onto the semi-final round on Saturday, Feb. 26th against Grand Rapids at the Amsoil Arena in Duluth at 2 P.M. Grand Rapids has already beat Cloquet this season by scores of 4-1 and 4-3 so the Lumberjacks will be looking to stop the bleeding at game #3. Kuhlman figured in on both of the Lumberjack goals with an assist and the game winning goal, which he netted just 12 seconds into the third period. Kuhlman’s two point night put him over the half century mark with 50 points. McFarlane also figured in on both Cloquet goals by scoring the first goal of the game in the second period and then assisting on Kuhlman’s game winner in the third period. McFarlane’s two point night put him at 53 points. Stong stopped 37 of 39 shots in the loss to Cloquet and he kept his team in the game through the entire effort making many huge saves to keep Cloquet’s top line at bay.